Use these laboratory derived data for comparison purposes only. The amount of protection afforded in field use is often significantly different, depending on how the protectors are fitted and worn. With a properly fitted set of vented Doc's Proplugs, you can protect against high-frequency hearing loss. Musicians and listeners must hear the fidelity of the original sound. This type of moderate protector will have a much lower noise reduction rating than do protectors for maximum attenuation including bass, such as conventional foam insertion plugs, fully sealed custom earmolds or muff type hearing protectors, The duration of exposure also plays an important role. The longer the exposure to loud sound the more likely is there to be damage to the ear. 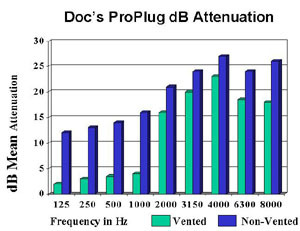 DOC'S PROPLUGS attenuates about 20dB across the high frequencies from 2000 to 8000 Hz. Rock concerts produce approximately l20dB. The ear tolerates a noise level of 120dB for about 2 hours protected by 20dB attenuation in the high frequencies. To know the sound pressure levels of environmental noise use a sound level meter available at most electronic suppliers. Note: The EPA requires labeling of Noise Reduction Rating (NRR), as the measure of a hearing protector's noise reducing capabilities. 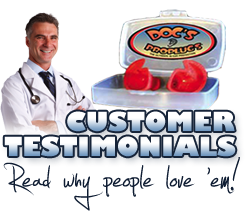 DOC'S PROPLUGS non-vented model has a rating of 7. The vented model has a low NRR of 2. The results of attenuation tests of bass frequencies (125-1000 Hz) are included in the American Standards Institute (ANSI) calculations. As the bass frequencies are very little attenuated by DOC'S PROPLUGS, then the NRR is very low. The level of noise entering a person's ear when a hearing protector is worn as directed is approximated by the difference between the A-weighted environmental noise level and the NRR. For example, if the environmental noise level as measured at the ear is 92dB and the NRR is 2, then the level of noise entering the ear is 90dBA. Caution: For noise environments dominated by frequencies below 500Hz, the C-weighted environmental noise level should be used. Although hearing protectors can be recommended for protection against the harmful effects of impulsive noise, the Noise Reduction Rating (NRR) is based on the attenuation of continuous noise and may not be an accurate indicator of the protection attainable against impulsive noise such as gunfire. 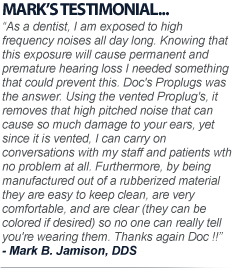 Ask your local ENT physician or music shop about Doc’s Proplugs and ask to be fitted.